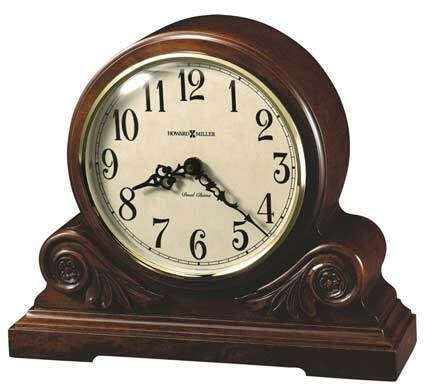 This Antique Reproduction mantel clock is lightly distressed and features carved leaf and rosette overlays. 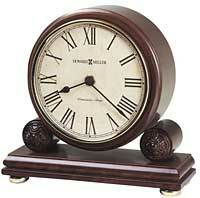 Beneath a convex glass crystal, the dial offers black Arabic numerals and black serpentine hands. 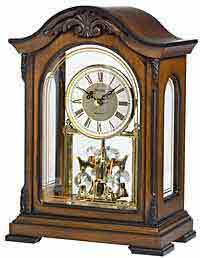 Quartz, dual chime movement plays Westminster or Ave Maria chimes. Features volume control and automatic nighttime chime shut-off option. Finished in Americana Cherry on select hardwoods and veneers. 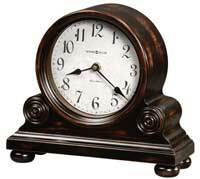 Size: Height 10-1/2" Width 12-1/4" Depth 4-1/2"
Clocks for sale at The Clock Depot including the 635-138 at discount prices.